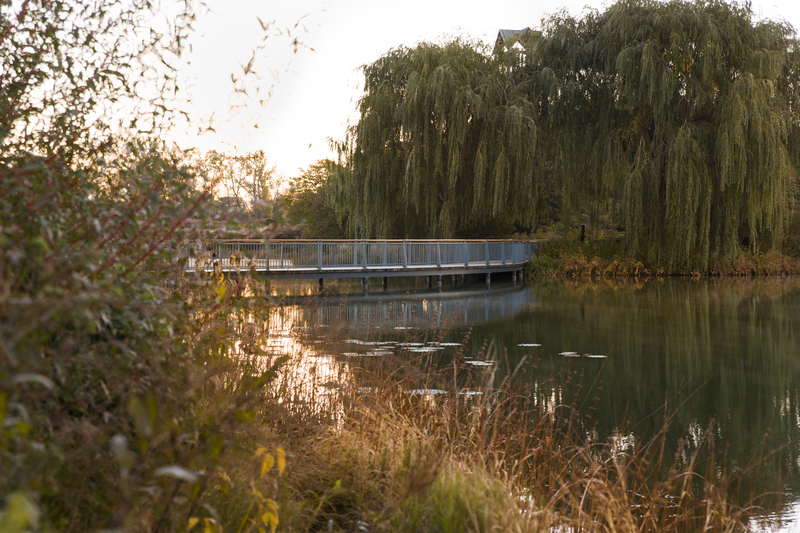 It’s the humblest patch of green at the Chicago Botanic Garden, yet the information gathered there has national implications—and, though you may not realize it, it’s part of your daily prep for work, school, and play. Although dealing with the weather is part of everyone’s job here, there is no meteorologist on staff at the Garden. Got questions about weather specifics or cooperative weather stations? Stop by our Plant Information Service desk (just outside of the Lenhardt Library) for local findings. Contact the experts at the National Weather Service. 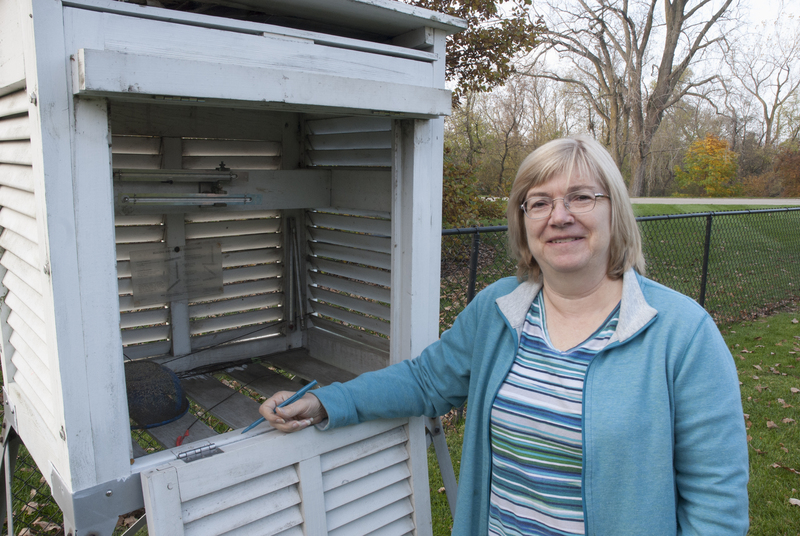 In a small, sunny, grassy, flat, fenced-in plot (there’s a reason for that), located on the outer road that encircles the Garden, stands an official National Weather Service Cooperative Station—a collection of instruments that measures the atmospheric conditions of the day. And every morning at 8 a.m., rain (or snow) or shine, a dedicated Garden staff member steps into the plot to read the instruments and record the results, then heads back indoors to transfer the information to the National Weather Service (NWS). I got to tag along with Celeste VanderMey, Plant Records supervisor, on a recent fall morning for the daily readings. Celeste VanderMey explains that its beehive appearance might deter curious critters from poking around inside the weather shelter. Though it looks vaguely like a beehive, the little white structure is a weather shelter that houses two temperature gauges. The maximum temperature thermometer’s mercury rises to the high temperature mark of each day, then stays at the setting until it’s read the next morning. To reset it, Celeste just gives it a spin and the mercury drops. An alcohol thermometer records the low temperature of each day: pure alcohol molecules move closer together as the temperature drops, shifting a tiny bar that marks the number. Why no digital thermometers? “Not considered as reliably accurate,” Celeste says. 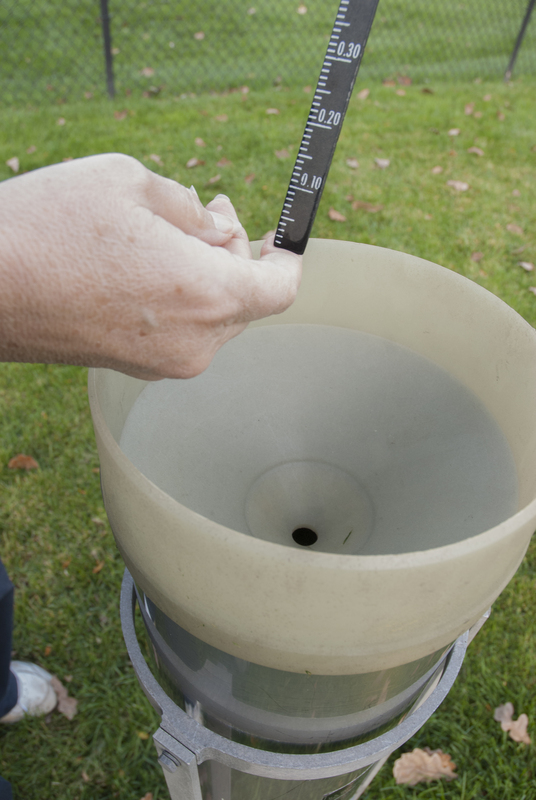 A long metal cylinder like a tiny rocket ship turns out to be a rain gauge. Celeste removes the lid and takes a reading. Admittedly the least scientific of the daily measurements, dewfall is indicated as low, moderate, or heavy, simply by examining a surface: the top of the weather shelter or the grass itself. The National Weather Service provided us with the rain canister, which can hold up to 10 inches of precipitation (not that we’ve ever had that amount—see records below). Inside is a plastic funnel that directs rainwater into a smaller brass tin. A measuring stick—like a car’s oil dipstick—is inserted, then pulled out and read for rain depth—one-tenth of an inch of rain equals one inch on the stick. A soil thermometer is as handy for home gardeners as it is for us—especially in spring, when it tells gardeners if it’s warm enough to put seeds in the ground. We measure the high and low temperatures of both bare soil and soil under sod/grass (that’s why the plot is flat, sunny, and grassy). An interesting fact: no matter what the air temperature is in winter, the soil seldom drops below 26 degrees (it’s measured at a 4-inch depth). 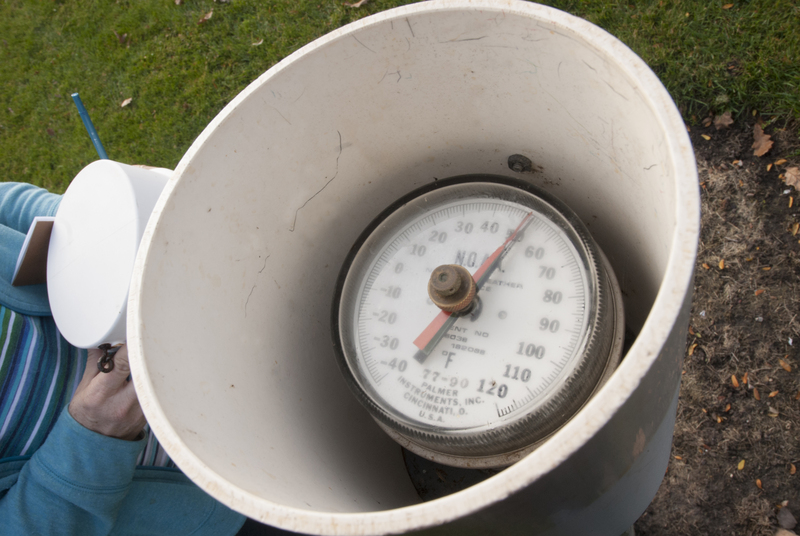 This gauge takes a reading of bare soil temperatures. Five feet away, another gauge measures the temperature under grass. It’s important information for farmers germinating seed. It’s low tech, but it works: a white plastic board catches a winter day’s snowfall, which is measured with a yardstick to the tenth of an inch. Two or more inches of snow? Then a core sampling is taken down to the ground, and the core is brought indoors to melt for a water equivalency reading. As mentioned below, the NWS uses this information to predict flooding. Next we moved to the 4-foot diameter evaporation pan. Its three readings tell forecasters how much water has been absorbed into the atmosphere at this location. An instrument with an intriguing name, a six’s thermometer, measures both high and low daily temperature of the water in the pan. An anemometer (wind meter) tells how many miles worth of wind has passed this spot. And a hook gauge in a stilling well measures the amount of water lost to evaporation (or added by rain). 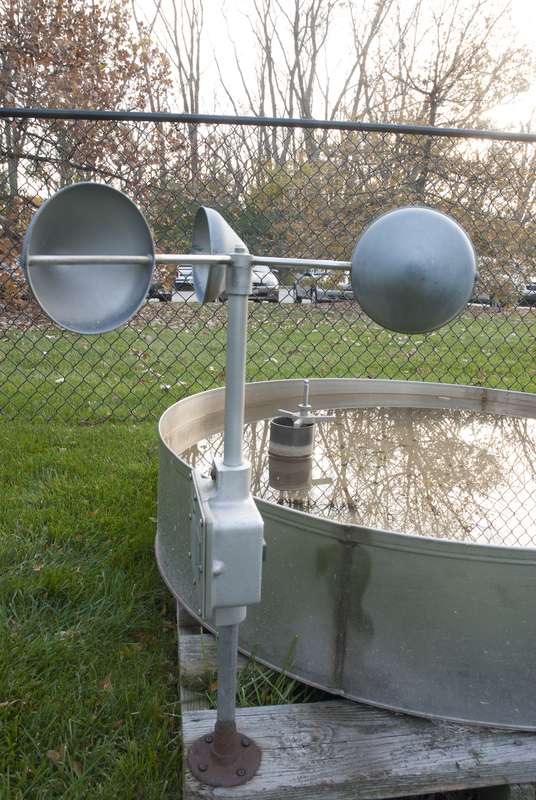 The anemometer attached to the evaporation pan measures the wind speed at an exact height. All weather station gear must meet siting requirements, so that data is measured consistently from station to station. 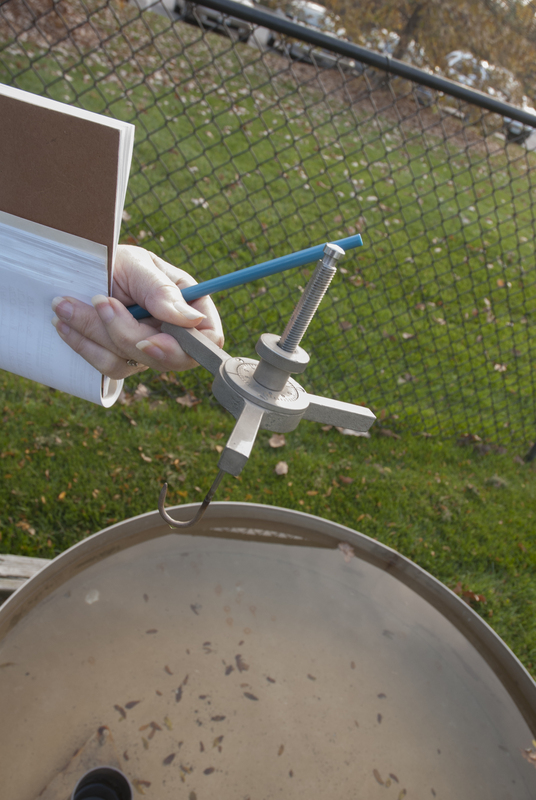 The hook gauge rests in a standard-size stilling well inside the evaporation pan—the structure the anemometer is attached to in the previous photo. Finally, we took a short walk across the road to the south bridge, and the weir (dam) beneath, where the waters of the Garden Lakes meet the Skokie River. Along the banks on each side of the bridge are measurement markers that are read (bring the binoculars!) and recorded daily, although they’re for the Garden’s own record keeping rather than the NWS’s. Why track the lake and river levels? Flooding is always a threat in our lake system, says Bob Kirschner, director of restoration ecology. “We look at the levels every day,” he explains, “and we can adjust the lake level in anticipation of excessively wet or dry weather forecasts.” All of the Garden’s property is irrigated with water drawn from our lakes. Water levels matter to the half-million lakeshore plants that line the lakes, too—all installed with our normal lake level (623.95 feet above mean sea level) in mind. It takes just a few minutes’ time to record the morning’s numbers. Indoors, Celeste logs on to the NWS site and inputs the results, adding noteworthy conditions as needed: fog…haze…ice…thunderstorms. January 2014 holds our record for the snowiest January with 28.7 inches (the 1967 snowfall was higher). February 2014 holds the record for the coldest February: 26.6 degrees was the average high (usually 35.6 degrees). 1993 holds the record for the shortest growing season (number of days between the last frost and first frost) at only 123 days. The average—163 days. August 14, 1987, holds the record for the most rainfall in one day: 5.54 inches. It’s fascinating to think that the Garden contributes daily to the national weather picture and that there’s always an eye on the weather here (thanks to Celeste, Veronica, Gabriella, Therese, and Lauren). Next time you check on the weather and hear a forecaster say, “and the Chicago Botanic Garden reported ‘x’ inches of rain yesterday,” you’ll know where the information came from: a humble patch of green. John Companius Holm’s weather records, taken without the benefit of instruments in 1644 and 1645, were the earliest known observations in the United States. Subsequently such famous personages as George Washington, Thomas Jefferson, and Benjamin Franklin maintained weather records spanning many years. The first extensive network of cooperative stations was set up in the 1890s as the result of an act of Congress in 1890 that established the Weather Bureau. Today, there are over 11,000 volunteer cooperative observers scattered over the 50 states, taking observations seven days a week throughout the year. The above observers regularly and conscientiously contribute their time so that their observations can provide the vital information needed to define the climate in their areas. The records are also used constantly to answer questions and guide the actions of public agencies, agricultural and commercial organizations, and individuals. Their records also form a basis for preparedness for national and local emergencies, such as flooding. Our most frequently asked question this summer at the Regenstein Fruit & Vegetable Garden: why no apples? Turns out the weather played a major role. 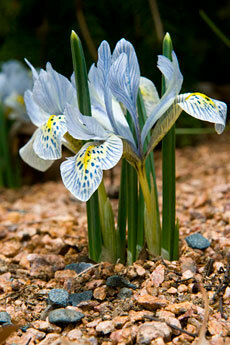 Last winter’s long, deep cold meant very few flower buds. Then, in spring, when pollinators should have been out to feast on apple flower nectar, the weather was chilly. Since bees don’t fly when it’s under 40 degrees Fahrenheit, little pollination took place. No pollination means no fruit. Add to that a second factor: apples typically have a two-year boom-bust cycle for fruit bearing. After a bumper crop in 2013, we expected a smaller harvest this year—made even less by the weather conditions above. Fall is a great time of year to challenge yourself to compose images that include complementary color relationships. Wet surfaces make colors more vibrant. Stone and masonry take on rich tones and show more color variation than when they are dry. This photo by volunteer Bill Bishoff was taken during a light rain. Notice how the bricks appear with a vibrant rosy surface that otherwise would appear pale. This image also takes advantage of complementary colors to make the subject pop. Complementary colors appear opposite one another on the color wheel— blue/orange, red/green, and purple/yellow. Together, complementary colors appear brighter. In this image, Bill includes two complementary pairs—purple/yellow and red/green. It is important to make sure you and your equipment are protected from the rain. You don’t need anything more complicated than a plastic bag and a handkerchief. Poke a hole in one end of the plastic bag for your lens, and peek in the other side when you are ready to take a picture. The handkerchief helps to dry off any raindrops that fall on your lens. If you use a UV filter on the end of your lens, you can safely wipe it dry it without worry of scratching the lens. If any damage occurs, you need only replace the filter, not the lens. Keeping yourself dry is also a good idea. If you are caught without an umbrella, there are plenty of dry vantage points around the Garden. You could appreciate the vistas from the comfort of McGinley Pavilion, or enjoy the solitude of McDonald Woods from the woods shelter. During fall, sunny days can become scarce, but an overcast or rainy day can also be a great photo opportunity. Join us on the first Saturday of every month for a photo walk in the Garden. We’ll cover a different subject each month and take some photos together.